On October 14, 1947, the Bell X-1 became the first airplane to fly faster than the speed of sound. Piloted by U.S. Air Force Capt. Charles E. "Chuck" Yeager, the X-1 reached a speed of 1,127 kilometers (700 miles) per hour, Mach 1.06, at an altitude of 13,000 meters (43,000 feet). 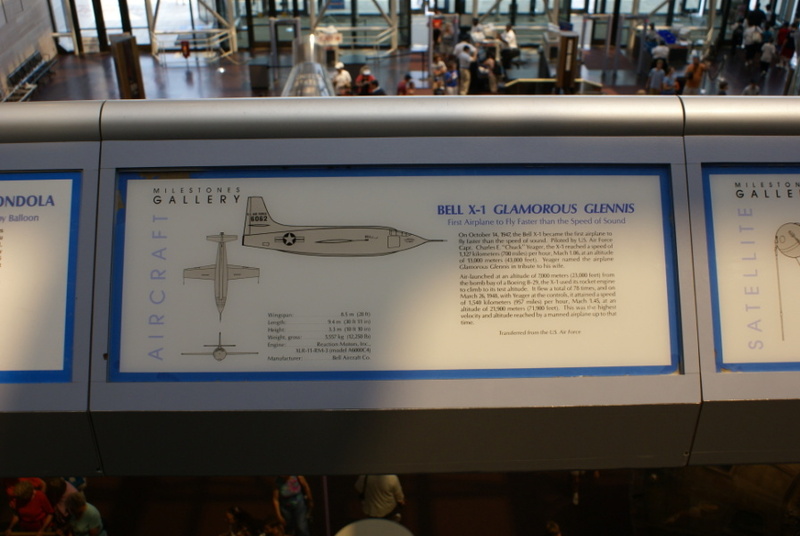 Yeager named the airplane Glamorous Glennis in tribute to his wife. Air-launched at an altitude of 7,000 meters (23,000 feet) from the bomb bay of a Boeing B-29, the X-1 used its rocket engine to climb to its test altitude. It flew a total of 78 times, and on March 26, 1948, with Yeager at the controls, it attained a speed of 1,540 kilometers (957 miles) per hour, Mach 1.45, at an altitude of 21,900 meters (71,900 feet). This was the highest velocity and altitude reached by a manned airplane up to that time. The X-1 is NASM catalog #A19510007000.